The VPHBP Program is a collaborative effort with local health departments and private providers to identify hepatitis B surface antigen (HBsAg) positive pregnant women, their household contacts, and sexual partners. * Once identified, free testing and vaccine, if needed, is provided to the contacts and partners of these women. Free Hepatitis B Immune Globulin (HBIG) and hepatitis B vaccine for newborns of infected mothers are provided to the delivery hospital and the infant’s physician to prevent the spread of HBV from mother to newborn. * Effective December 18, 2001, all HBsAg positive pregnant women are reportable by law to the local health department. Approximately 1.25 million persons in the U.S. are infected with chronic hepatitis B. Of these, approximately 4,000-5,000 die each year from chronic liver disease. Children less than 5 years of age infected with the hepatitis B virus (HBV) have a 30-50% chance of chronic infection and chronic liver disease. Up to 90% of infants perinatally infected will develop chronic infection. Of these infants, 15-25% will die of chronic liver disease as adults. Perinatal transmission accounts for 24% of chronic infections. All pregnant women are required by law to be tested for hepatitis B surface antigen (HBsAg) during an early prenatal visit. Effective December 18, 2001, all hepatitis B surface antigen (HBsAg) positive pregnant women are reportable by law to the local health department. The local health department reports the results to the Virginia Department of Health (VDH) and notifies the VPHBP Program. The VPHBP Program initiates disease intervention activities to identify and vaccinate household contacts and sexual partners. Tracking contacts and infants of HBsAg positive pregnant women to ensure that appropriate treatment is received, thereby eliminating the transmission of perinatal hepatitis B. Free prevaccination testing for sexual partners and household contacts of the HBsAg positive pregnant woman and free hepatitis B (HB) vaccine for all susceptible partners and contacts. Free post vaccine testing of sexual partners. 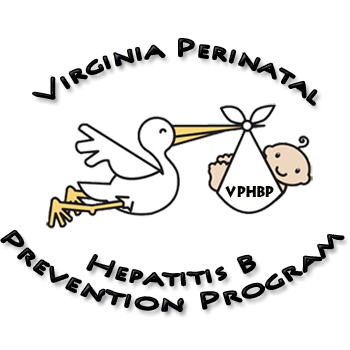 The local health departments, upon referral from the VPHBP Program, provide these services. The infant’s physician and delivery hospital are alerted about the HBsAg positive status of the mother. Hepatitis B Immune Globulin and HB vaccine are provided at no charge to delivery hospitals. Free HB vaccine for completion of the series is provided to the infant’s physician. Free post vaccination testing for infants 3-9 months after completion of the HB vaccine series to ensure protection against HBV.